Warm, wet weather is prime weather for fleas. During late spring and all through summer, most regions experience outbreaks of fleas. However, fleas do not care about the calendar. As long as the area is warm enough (about 60 degrees or warmer) for them to breed, and the adult fleas have a blood meal, they will breed. As long as larvae have sufficient humidity to hatch (50 percent at least), they will hatch. Because of climate-controlled homes, fleas easily breed inside all yearlong if homeowners don't eliminate fleas, flea eggs and flea larvae. 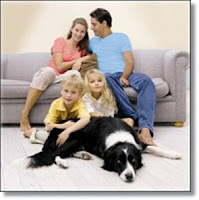 Fleas are pests that can take over a house, infest a pet's fur and administer bites that result in severe itching. The American Society for the Prevention of Cruelty to Animals (ASPCA) says, Fleas are the most common external parasite to plague companion animals. They are wingless insects that feed on blood, can jump up to two feet high and make a very comfortable home in your pet’s fur. They can live for as few as 13 days or as long as 12 months—and during that time, can produce millions of offspring. Though there are many species of fleas, the one that most often affects both dogs and cats in North America is the cat flea, Ctenocephalides felis. There are over 200 different types of fleas in America. The most common type of fleas to affect humans is the cat flea or xenopsylla cheopis . The cat flea will happily feed on cats, dogs or humans. Flea bites on humans are often found on the ankles in groups of three. 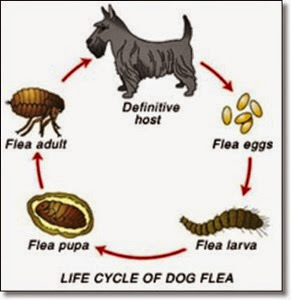 You can treat the flea bites on your body, but in order to stop the cycle of the fleas, you need to also treat your home and any infected pets to stop the life cycle of this flea in your home.